Crowns and bridges are just two of the popular restorative dental methods we use to help patients build a stronger, more beautiful smile. Our professional dental team is highly-adept at these procedures and are on-hand to answer any questions you may have regarding crown or bridge treatment. Our crown and bridge restorations are created in a trusted, local (Australian) lab, ensuring that you receive the highest-quality results every time. As dental professionals, you can also be assured that we only use materials which have proven to be safe, durable, and long-lasting. A crown is designed to restore and protect a single tooth which has been affected by issues such as trauma, a weakened structure, sizeable cavities and decay, or large cracks. 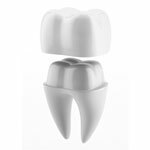 They can be thought of as a cap that surrounds the entire tooth. Crowns can be made entirely from ceramic or ceramic over a metal base for teeth requiring additional support. The use of ceramic materials in restorations allows the tooth to blend in seamlessly with a patient’s smile, resulting in a stronger, more beautiful smile, however gold is still the strongest, most predictable material, and may be the best option for back teeth where appearance is not an issue. Our crown treatment occurs across a minimum of two visits, with the initial appointment serving as the preparation stage. During your first visit, we prepare the tooth and take impressions of your teeth, with these impressions being sent to our lab to begin the crown making process. Your first appointment will involve the tooth or teeth receiving the crowns to be carefully reshaped. 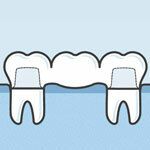 This ensures they are the same size and shape as your natural surrounding teeth once the crowns are fitted. It will take our skilled dental technician approximately 2-3 weeks to create your permanent crown. During this time we fit a temporary crown to the tooth to prevent possible sensitivity or discomfort and maintain an acceptable appearance and tooth position. Once your permanent crown has been made and sent back from the lab, it is fitted at the second appointment. Once fitted, you will be able to enjoy the benefits of your new crown, helping you to have a stronger bite and/or improved smile once again. Missing teeth can have a negative impact on your self-esteem and confidence as well as your oral health Bridges provide a simple yet effective solution to this problem. Our bridges are expertly designed to replace either a single tooth or several missing teeth. This restorative appliance is secured by crowns attached to healthy natural teeth on either side of the missing tooth or teeth. Similar to crowns, the process of creating and fitting a dental bridge will take place across at least two appointments. The procedure will begin with our dental team taking impressions of your mouth, before sending these off to the lab for the creation process. Once your bridge is received back from the lab, you will come in for another appointment so we can fit it to your mouth, resulting in an improved smile you’ll love. Crowns and bridges are effective treatments for correcting issues such as structurally-damaged or missing teeth, however it is important that you come in for regular oral hygiene appointments to ensure they remain in great shape.